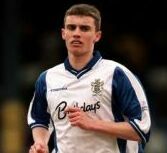 The former Bury hotshot Jon Newby has joined up with the Harriers on a one month loan deal today along with the former Peterborough defender Simon Rea. Jon Newby, who has played against the Harriers on numerous occasions before, started his footballing career at Liverpool in 1998 but left there a year later to join up with Carlisle Utd but never really settled in and eventually signed for Sheffield Utd, his biggest club so far. He first went onto his present club, Bury, in 2001 but midway through his time there and once he started to get onto the score sheets regularly he caught the eye of Huddersfield Town and signed for them in 2003. He never settled in there either and during his year there never scored at all but did find himself continually out of the side with various injuries. It's for that reason that he finds himself now at Aggborough following his recent injury at Bury. He made a comeback from the bench against Oxford Utd last week but Bury hope that by coming to Aggborough he can get some more competitive games under his belt in readiness for next season. Simon Rea, a defender, has also arrived here following injury and is also hoping to get himself fit enough to return to his parent club, Nuneaton, in time for next season. He started his career at Birmingham City in 1995 but left there in 1999 after racking up just three appearances for the club. 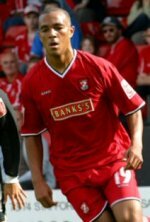 He then left there for Kettering Town and then onto Peterborough where he made a total of 184 appearances for the East Anglian side. The then moved a few miles down the road to join up with Cambridge Utd on loan for just four games before being released to join Nuneaton in May last year. Yesterday Junior Osborne left the club and returned to Watford and Rea will presumably step into the spot vacated by the rookie defender. Two other former Harriers have also found new homes with Marc Pugh joining Newby's club Bury until the end of the season and the same kind of deal has taken former loan strikerTaiwo Atieno from Walsall to Darlington.